In Britain, you can go to prison for over a year if you say anything against Islam. And it can happen swiftly. Too swiftly. Consider the case of citizen journalist Tommy Robinson, whom the authorities consider a nuisance. It’s hard to comprehend how England has turned so dark so fast. I visited in 1970 and it still had a vestige of Democracy and was proud of it. That is no longer the case since the advent of Sharia courts, and “hate speech laws” that punish those who love their nation and are treated as the enemy rather than the ordinary citizen. All of that happened the same day as his arrest. No “due process.” No attorney. No defense whatsoever. About 10,000 Facebook users watched his arrest live as it was occurring. 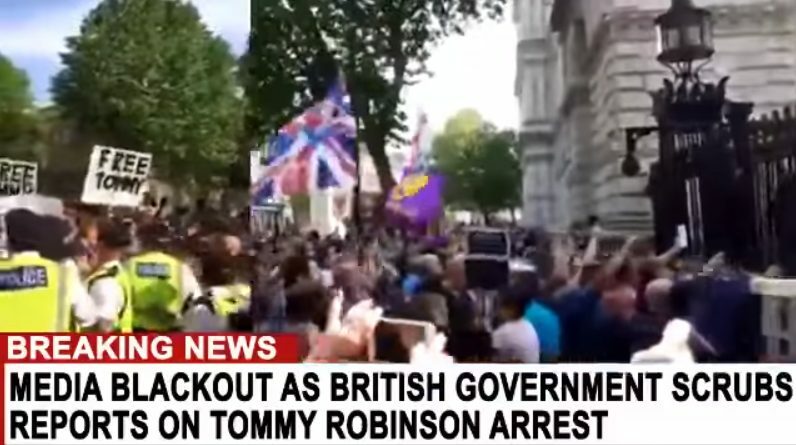 Angry crowds gathered in London, and demanded Tommy Robinson be freed. In March, Muslims rioted when Tommy Robinson spoke at “Speaker’s Corner” which was set up as a “free speech” zone. The authorities view Tommy Robinson as a provocateur, much like the authorities view people like Ben Shapiro or Milo Yiannopolous here. But the laws here are different than they are in Britain. The UK has seemingly gone full on tyrannical. Again. Will this incident lead to change in the UK? Or will blood be spilled in the process?